399 Fremont tower in San Francisco was first pitched in 2006. Delayed for nearly a decade due to the Great Recession, the tower was finally completed this year under the auspices of architects SCB and developer UDR, as a 42-story, 470-unit luxury apartment tower. And in the years since it was first envisioned (by a design and development team no longer involved with the project), the neighborhood around the site—Rincon Hill, south of downtown San Francisco—has blossomed with urban activity. Plans are currently in the works for up to 20,000 new housing units between Rincon Hill and the adjacent Transbay area, where a new $2.25 billion multimodal transportation terminal by Pelli Clarke Pelli will open in late 2017. 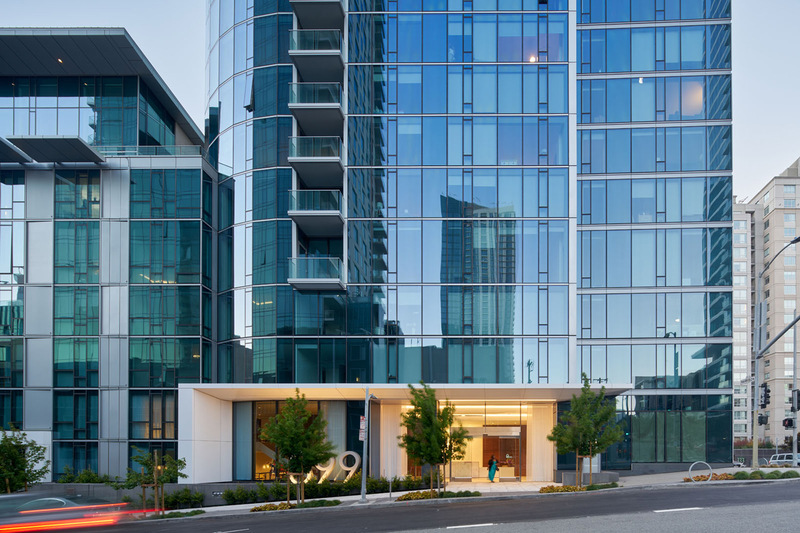 Through technical precision and determination, SCB has managed to turn a once-stalled project into one of the first to be completed in the area, creating a handsome tower smack in the middle of San Francisco’s newest residential enclave in the process. In total, the tower has approximately 30 unit types and is shaped like a parallelogram in plan. Inscribed within that parallelogram is a “rugby-ball-shaped” section of the building that, according to Forgan, rises out of the principal mass and becomes the tower’s crown. The maneuver results in two sets of units, with one grouping facing northwest toward the business district and another looking southeast over the San Francisco Bay. 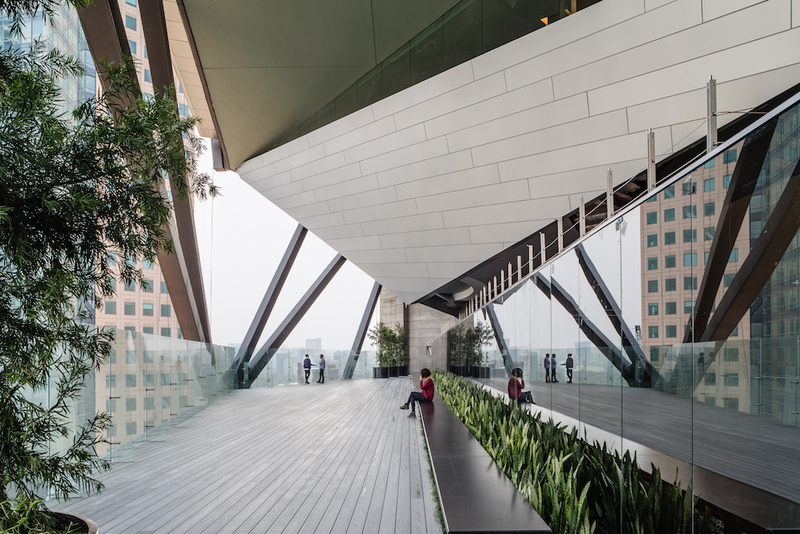 The steeply angled south-facing roof crown contains a “sky lounge” and terrace, a programmatic component provided by the neighborhood plan that allowed the designers to give the tower a more striking silhouette. The sloping surface was originally designed to cant in the opposite direction, but the firm proposed a last-minute change in orientation to better complement the tower’s placement along the skyline and, conveniently, to create a broad southern exposure perfect for hosting a solar water-heating installation. The move helped the tower reduce power consumption by some 30 percent. As a result, 399 Fremont will be LEED Silver certified. Otherwise, the project is made up of a standard mixed-use development vocabulary, with activated ground-floor areas, below-grade parking, and a slew of rooftop amenities. To control for seismic events, the project also features a pair of isolated mat slabs under both the podium and tower that each sit directly on the bedrock. Structural engineering on the project was done by MKA, who designed the two halves of the building to move independently of one another via a large seismic joint. Facade engineering was done by Arup. Arup also carried out thermal comfort analysis to ensure thermal comfort within the units throughout the daily solar cycle. The curtain walls, by manufacturer Yuanda, are designed to pop open during seismic events to relieve lateral pressure. Ground-floor spaces feature retail at the uphill side of Rincon Hill as well as a grand lobby for the apartment tower and a collection of landscaped entryways that mark the thresholds to townhouse units along Fremont Street, part of what Pemberton described as an “eyes on the street” approach to city planning contained within the Rincon Hill master plan. In 1985 Mexico City suffered a devastating earthquake. Occurring in the early morning on September 19, the quake took the lives of more than 5,000 people. The earthquake's vibrations of the lakebed sediments beneath the city also destabilized its skyscrapers. Such was the devastation that one nine-story tower collapsed, its piles ripped from the ground. New building codes were implemented after the disaster and now Mexican architecture practice L. Benjamin Romano Arquitectos (LBRA), working alongside working alongside engineering firm Arup’s New York office, has produced an earthquake-resistant skyscraper designed to last 2,500 years. Rising to 57-stories, Arup conceived pre-tensioned double-V hangers to brace the facade. According to a press release, in practice the skyscraper—named Torre Reforma (Tower Reform)—has an "inherent tendency to twist when subjected to lateral loads and wind" and "earthquake forces." While creating a signature aesthetic for the building, the hangers also provide visual reassurance of the its structural qualities. Materiality was a key component of the design process for the tower. Arup said that the finish of the concrete was "critical"; the firm evaluated numerous design mixes. Their final choice resulted in a smooth surface, free from honeycombing or other flaws. Poured in increments of 27 inches, the finish highlights the color variations that are commonplace in similar types of pours. In addition to its tectonics, the building's circulatory aspects were another area of focus. With a triangular floor-plan, LBRA strayed away from using the central core that's norm in skyscrapers. At Torre Reforma, the elevators and egress stairways are contained in the apex of the triangle. Long-span pyramidal floor trusses facilitate concealing the building's services. These trusses also enable dramatic column-free interiors and sweeping views of the city and the nearby Chapultepec Park. Additionally, Torre Reforma is a pre-certified as a LEED Platinum Core and Shell project, as it makes use of various water conservation systems and a combination of automated and passive ventilation systems to moderate temperature. "Arup has been indispensable in helping to transform my architectural vision into an efficient and buildable structure," said Benjamin Romano, Principal of LBRA, in a press release. "They have provided innovative solutions to the complex seismic issues in Mexico City and have been instrumental in helping the bidding contractors understand that Torre Reforma is not more complex than standard vertical construction; it just applies traditional construction methods, that contractors are already familiar with, in a new and different way." 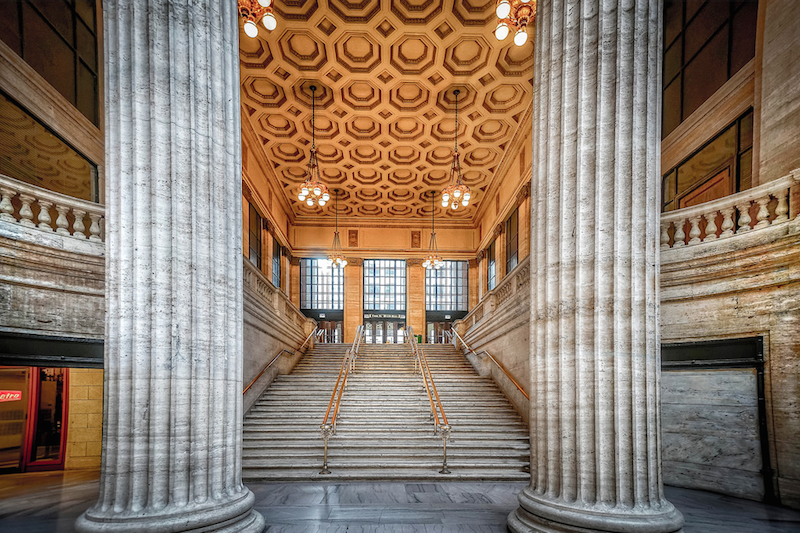 After years of rumors, Chicago’s Union Station improvement project has taken its first steps forward with the announcement of a lead designer. The global design and engineering firm Arup has been tapped to carry out a total of 13 upgrades to the station, which include expanding concourses and platforms as well as adding a new ventilation system. Amtrak, who is in charge of the renovation effort, owns the station as well as the air rights. Earlier in the year they sent out a request for information to developers in order to choose a firm who could handle the master plan. Union Station the third-busiest rail terminal in the U.S., after New York's Grand Central and Penn Station. The vast majority of its 120,000 daily riders use Metra, Chicago’s commuter railroad. According to Metra board chairman Marty Oberman, the station wasn’t set up to support such a large volume of people when it opened in 1925. 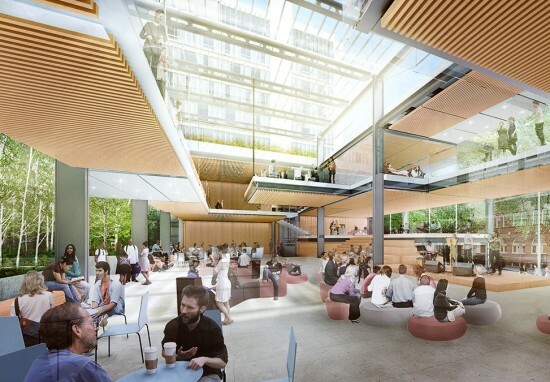 Outlining the major issues that needed to be addressed by the renovation, Oberman told the Chicago Sun Times that “the platforms were built for another era. They’re far too narrow. When we have weather back-ups and so forth, we can have very serious crowd control problems with the way this station is designed. The concourse has way outlived its usefulness...We all know that the ventilation system desperately needs to be redone. We hear about that constantly from our passengers.” Amtrak has not yet put a price tag on these improvements, although Oberman suggested it would add up to “several hundred million dollars.” Daily commuters, who have long lamented the difficulty in navigating the aging station, will likely consider the improvements long overdue. Architects have long relied on engineers to help execute formally or functionally complex concepts. But, as Belzberg Architects founder Hagy Belzberg points out, "architects usually work out a schematic design" in response to a client's needs, "only later to invite the engineer to help substantiate their idea." 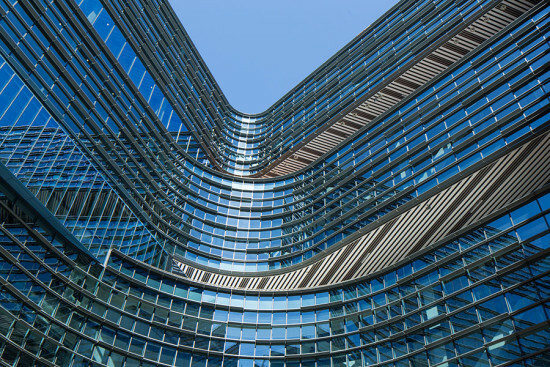 Belzberg's own experience collaborating with facade engineers at Arup suggests a different approach—one in which the designers and consultants trade ideas and expertise from the very beginning. With Arup's Matt Williams, Belzberg will outline some of the benefits of a close association among AEC industry professionals through two cutting-edge case studies at next week's Facades+ LA conference. Belzberg and Williams' dialog workshop, "Process Shaping Design: Design, Digital Fabrication, and Delivery" is organized around two projects with distinct origins. The first is the Gores Group Headquarters (9800 Wilshire Boulevard) in Los Angeles. "The building will be a case study in how adaptive facades can help us reappropriate existing buildings so we don't have to knock them down," said Belzberg. Digital fabrication technology, he explained, allowed Belzberg Architects to craft a new envelope that is "highly sculptural and unique, but still performative." The second case study examines a series of commercial buildings in Mexico City. 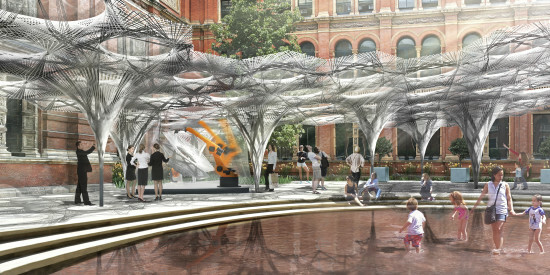 "It's the same digital fabrication on a new building," said Belzberg. In contrast to the more typical approach, Belzberg Architects brought Arup on board before touching pencil to paper (or hand to computer mouse). "What we're trying to promote is a case study in which we brought in the engineers on day one, so it becomes more performative, more efficient, and even more cost-effective," said Belzberg. Besides sharing some of their own work, Belzberg and Williams hope to use the workshop to dig into other examples—cases contributed by the participants themselves. "No one's going to have to do any homework, or any sketches," said Belzberg. "But we want people to come in with case studies of their own that we can work on: Not just questions and answers, but we're hoping that other architects will bring real-life scenarios so that we can brainstorm opportunities. It's not just about our work, but an opportunity to discuss audience case studies." To sign up for "Process Shaping Design" or another lab or dialog workshop, register today for Facades+ LA. Learn more and review the symposium agenda on the conference website. 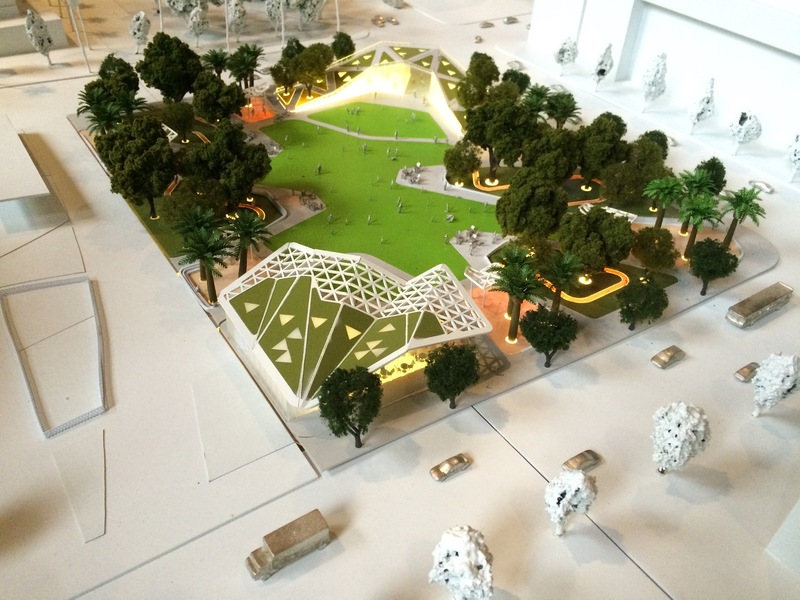 First there was the Grand Park, then Pershing Square decided to spruce things up with a design competition, and now four competing schemes for a third Downtown Los Angeles park were presented to the city in a public meeting this week. The proposals were from teams lead by AECOM, Brooks + Scarpa, Eric Owen Moss Architects, and Mia Lehrer + Associates with OMA and IDEO. 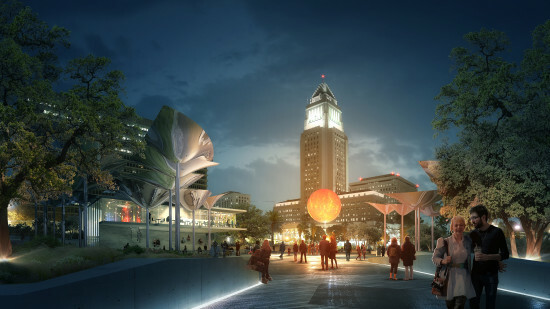 The two-acre First & Broadway Civic Park will take over a full block in the heart of the L.A.’s Civic Center near City Hall and the Gordon Kaufmann’s Art Deco Los Angeles Times building. The overall greening of Downtown Los Angeles is consistent with its ongoing renewal. As such, each of the teams provided ample amenities in the park—canopies, cafes, music venues, movie screens—in addition to the standard fare of gardens, trees, and benches. AECOM’s proposal takes iconic modernist landscape architect Garrett Eckbo’s 1946 Landscape for Living as a starting point, and then updates his California dream to be a collective experience. Hints of fifties modernism show themselves in the irregularly shaped lawn, which is framed by “The Wingnut,” which houses a gallery, and a 200-seat restaurant “The Paper Plane.” Undulating ribbons—green space above, amenities underneath—define Brooks + Scarpa's plan. The team suggests that the scheme is ecological with drought-minded plantings and integrated terraces and cisterns that lead to an expansive dry well. 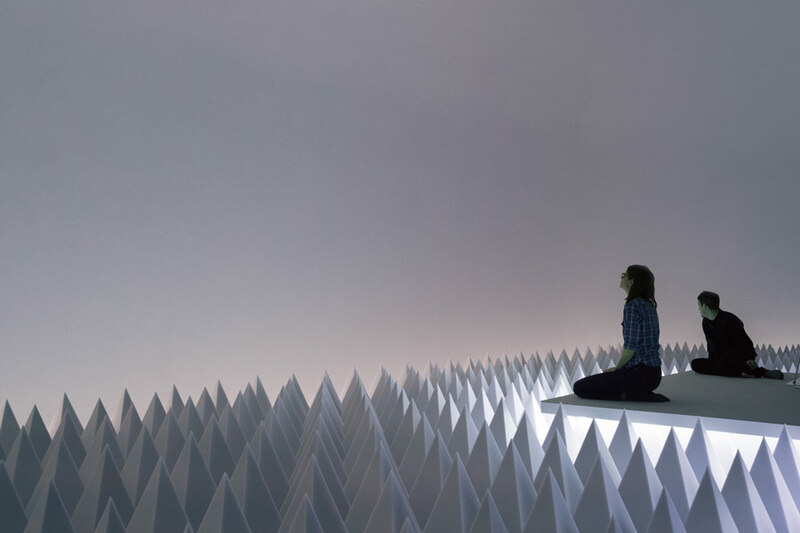 Hidden within the proposal is some programming sure to excite the design community: the Architecture and Urbanism Festival, a possible 3-month long curated event that would include temporary installations and public programs. Eric Owen Moss Architects, never a firm to shy away from odd forms, proposed a large cocoon-like structure dominates a rolling and grassy green space. 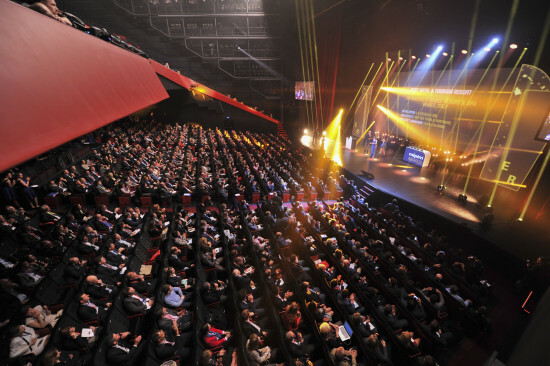 Ready to compete with the nearby crowning towers of City Hall and the Times, EOM’s event pavilion seems equipped to screen films and host events. Mia Lehrer + Associates powerhouse team also includes OMA, IDEO, and Arup, among others. Their proposal takes food as its design driver. While the scheme shows a central paved plaza and side gardens lush with alien-ish shade canopies and mature trees, the main emphasis is on a multi-use pavilion building that includes a beer garden, a test kitchen, a restaurant, and an amphitheater. Presentation boards and models of the designs are on public display at the Department of Building and Safety at 201 North Figueroa. Zaha Hadid, with Arup and Mello Affonso Engineering, is executing her first project in South America. Casa Atlantica is a luxury residential building in Copacabana Beach, Rio de Janeiro. According to ARUP, Casa Atlantica was originally planned as a luxury hotel but changed to a residential building in order to meet the region's urban standards. 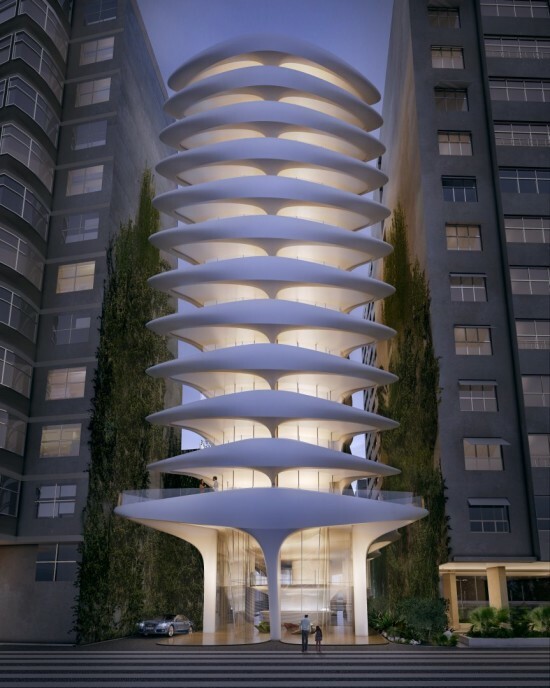 The client, Brazilian entrepreneur Omar Peres, gave Hadid complete design liberty. She was, however, governed by strict requirements on height and proximity to neighbors. Zaha Hadid Architects' explained their response to these constraints: "Working within site restrictions governing the height and distance from adjacent buildings, Casa Atlantica's design establishes a fluid order defined by its structure which morphs and expands at each level to create balconies, while also dividing each floor into separate residential units." Casa Atlanta will be 18,000 feet-squared, have 12 floors, feature a rooftop swimming pool, and reach approximately 130 feet in height. Construction is set to begin in March. For further information, visit Zaha Hadid Architects' project page here. 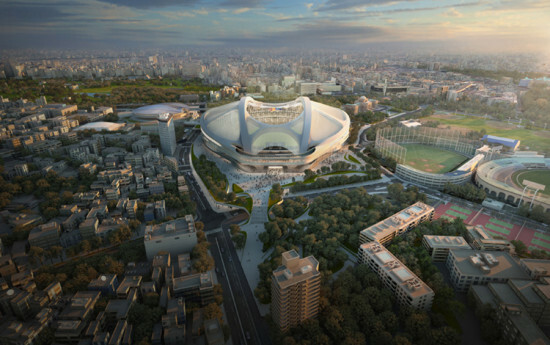 In an attempt to salvage the now-scrubbed project, Zaha Hadid has released a new video in defense of her firm's design for the 2020 Tokyo Olympics Stadium. The film presents a robust—albeit familiar—argument for the reinstatement of the building. Once the bona fides of the project team (which includes Arup Sports) are revisited and a sensitivity to Japanese culture is declared, the oblique blame game begins. https://vimeo.com/137299144 Citing the substantial investment that's already been made in developing the project, Team Hadid suggests that the construction bidding process be restarted, in an attempt to reduce the estimated $2-billion-plus cost to erect the stadium. From the video: "To start the design from scratch is an unnecessary risk, which we think the government should reconsider if its aim is to achieve a lower price...we believe the answer is to introduce more competition between the contractors, but not to lose the benefits of the design." So far, there has not been a response to the video from Olympics officials.